Leafy potato plants flourish atop a low mound of yard clippings covered with straw. There'll be a good harvest this year. "The fact that we can grow potatoes out of what would be considered our waste pile is fabulous," enthuses Pam Hartwell-Herrera, executive director of Sustainable Fairfax. She's standing in the group's Sustainability Center, opened last October in a former single-family home opposite the Fairfax Town Hall in the gently rolling hills of Marin County. In the center's postage-stamp-sized front yard squats a claw-footed bathtub painted a jaunty blue and filled with water and plants. The overflow from the bathtub/pond is piped a few yards away to what Hartwell-Herrera calls a "rain garden"—a soft, luscious blend of rocks, dirt and plants. "It's a way to capture water and have it slowly sink into the ground rather than go into the flood drains," Hartwell-Herrera explains. "It creates a unique space where you can grow things you otherwise couldn't grow." The place is sustainability made real, giving form and substance to the nonprofit group's desire to find ways to create a local, can-do approach to preserving natural resources and combating global climate change. The emphasis is on solutions, not problems, Hartwell-Herrera says. "We don't believe in eco-guilt. We're against it. We believe in eco-inspiration." 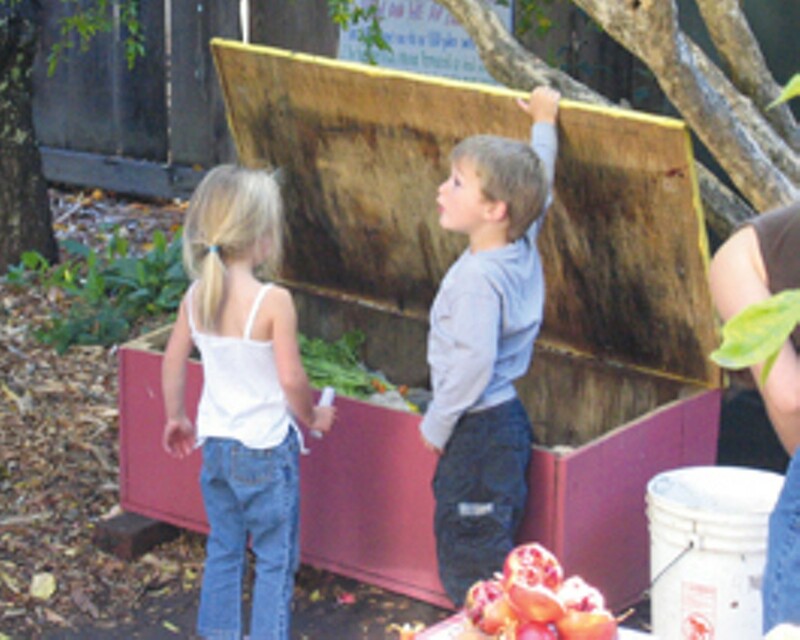 Founded in February 1999 under the now-defunct Sustainable North Bay organization, Sustainable Fairfax is one of several independent groups in the area, such as Sustainable Mill Valley, Sustainable Novato and Sustainable San Rafael. Each has a seat on the board of the umbrella organization, Sustainable Marin. "We consider ourselves colleagues and partners with them," Hartwell-Herrera says, adding, "We're working to keep all the sustainables on the same page, collaborate on policy issues and be able to make sort of broader statements on countywide issues that we all feel the same way about." A prime example is Marin Clean Energy, the effort to create a new power agency to collectively buy nonpolluting renewable power, with PG&E continuing to be responsible for transmission lines, billing and other duties. The new agency would eventually plan, build and own new renewable power-generation facilities such as wind, geothermal, biomass or solar. "This was actually a project that our founder took on and brought to our town," Hartwell-Herrera recalls. "The town took it on and became the first town for Cities for Climate Protection in Marin. And then they went to the county level, and the county took it on in a really championing way. It is now being shopped around to every town in Marin to get them to opt in and join the county in what could bring 100 percent renewable energy to Marin." Another ongoing project is the push for a plastic-bag ban. Last year, Sustainable Fairfax teamed with the Inconvenient Group (formed after founder Renee Goddard saw Al Gore's movie An Inconvenient Truth) to "green"-up the Fairfax farmers market. Volunteers handed out cloth grocery bags and replaced the smaller plastic vegetable bags with "compostable" bio-bags made from nongenetically modified corn products. In one night, 1,200 bio-bags were distributed, highlighting how much plastic gets used each week. Sustainable Fairfax continues the push to "green" not just the local farmers market, but markets and stores throughout Marin and the North Bay. The Fairfax Town Council approved a plastic-bag ban, only to be stymied by the threat of a lawsuit from the plastic manufacturing industry. Now Sustainable Fairfax is working with others to place a plastic-grocery-bag ban on November's ballot, because although the town could be sued over a ban, the voters can't. Sustainable Fairfax has a core of about 30 volunteers, but more than a hundred people are involved in its various activities. "I don't think there's any one particular stereotype of who Sustainable Fairfax is," Hartwell-Herrera notes. "It's just a lot of people who want to be working in a positive direction." The challenge is to maintain the group's focus on its key issues. Unofficially, Hartwell-Herrera says, those are climate change (including energy and transportation), toxics, waste, food and water. "We try to stay focused on those and bring as much of that as we can to build a self-reliant community." The main emphasis is on showing what's possible, says Sustainable Fairfax president Scott Valentino. "People are desperate for solutions, but they don't know where to begin. There's so much that can be done, but people are unaware of how easy it can be at times." The goal is empowerment, not guilt. "People don't come away from Sustainable Fairfax saying, 'This is what you guys should do.' People come away saying, 'This is what I can do.' That, I think, is one of the most successful things that we do," Valentino says. The Sustainability Center is located at 141 Bolinas Road, Fairfax. Open Friday&–Sunday, noon to 4pm. 415.455.9114. www.sustainablefairfax.org.